In my limited ministry experience there seems to be stages of oneâ€™s career, especially as it relates to Christians and leaders. Since I am not finished on my journey and no man can be sure of how long he will traverse this abode, I will describe my experience to this point. First, one begins with salvation and a youthful exuberance toward the Lord (even if you receive Christ at an older age, you still begin here). You love to read your Bible, and you do everything that your spiritual leaders (youth pastor, senior pastor, Sunday School teacher, etc.) tells you that you are supposed to do in order to be a good Christian. You are ignorance on fire. It doesnâ€™t take very long before you move to the next stage of omniscience. You know a person is at this stage because they have figured everything out. Every question is answered and there are no doctrinal discrepancies, no grey areas, everything is black or white. Even though they have not lead a ministry, started any initiative, or even held a real leadership position they know how everything should be done and what everyone else is doing wrong. It is during this stage that one forgets that they were once a lost soul and often times begin to think they are deserving of their salvation because of their high moral standard. From their height they can see the world and can see all that is wrong with it if only they were in charge to fix it. Eventually over time those false precepts begin to fade and crumble as one actually engages in true ministry. When you wade nose deep in the world and actually implement those crystal clear strategies you learned from a book from a leader on the other side of the country in a completely different cultural setting â€“ and they donâ€™t work. You find yourself having to deal with the actual leadership decisions that you have made. You begin to be filled with self-doubt. You doubt your calling. You struggle with your relationship with God. You question Him. You doubt His love for you. You want out from the weight that is suffocating you. You start blaming, pointing fingers, and just are not very fun to be around. But over time God moves. He has always been moving you just didnâ€™t see it. You rediscover His grace and goodness. You are a leader but one that is â€œas by fire.â€ You have been in the trenches long enough to know that you are lucky to be in the battle and to even be a leader at all. You have war wounds that will follow you the rest of your life like Jacob and his hip. You have learned to focus on the task that God has put before you today and have stopped trying to climb some false career ladder (hint: it doesnâ€™t exist). You have learned to stop looking around and comparing yourself to others and have rediscovered your friendship with your Savior. I know there are more stages but that seems to be as far as I can show you. For those of you who may be at any of these stages, you know what I have found to be curious? There is no magic or secret knowledge that the â€œbig leadersâ€ keep in some back room somewhere. There are no secret handshakes or magic words. At least I donâ€™t think so (since I am not a â€œbig leader.â€) What I read and memorized as an early believer is the same truth that sustains me an aging church leader. The truth has been there the whole time. I had convinced myself that I knew how to do things better or on my own without what God had given me the whole time. In this passage God the Father is described as a vinedresser. He determines the over all direction and condition of the entire orchard. The branch is a tiny part of a much bigger plan and direction. God the Son is described as a vine and believers are described as a branch. The branch gets what it needs to produce fruit from the vine. 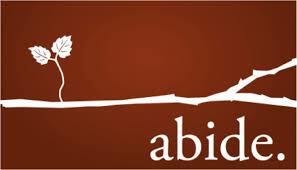 The branch cannot produce fruit without what it needs from the vine, so it has to stay attached (or abide) to the vine. It can produce nothing without being attached. When Jesus gave the disciples this teaching he is anticipating three responses. We feel pain for two reasons. The first is because we are not doing what God created us to do. For a branch itâ€™s purpose is to bear fruit. You must ask yourself, â€œWhat was I created to do?â€ The immediate answer is to bring glory to God. But how are you doing that? If you are only focused on yourself then God is using this pain in your life to get you to see that. If you are seeking to bring God glory with your life and you are feeling pain then He is using the pain to make you even more effective. When a plant is pruned it comes back healthier and more productive. When a believer experiences pain and suffering he will endure it and come back stronger and able to do even more for the Lord. We live in a broken and fallen world â€“ if we are to reach it we will endure pain and suffering. There is no need to clean yourself up. Godâ€™s Word is true. 1 John 1:9 â€œIf we confess our sins, he is faithful and just to forgive us our sins and to cleanse us from all unrighteousness.â€ The vinedresser wants to use you (as a work in progress) to reach the world for His Son. He will be working on you and you are reaching others for Him. When you have been in ministry 20 years or 20 minutes the way we do effective life changing ministry is the same. When we understand that it is not up to us to â€œsaveâ€ anyone or to change their lives â€“ it is Jesus (and the Holy Spirit) who does it through us. As a branch is close to the vine and receives the nutrients from it â€“ we as believers receive what we need to do ministry from Christ (and Christ only). He produces the fruit through us. If allow Him to do this then we will be pruned, if we donâ€™t then we will be separated from Him (and will begin to feel the distance between us). You donâ€™t have to have all the answers or know the big plan. Your one job is to stay close to Jesus, â€œfor apart from me you can do nothing.â€Â He will tell you what you need to know and he will direct your day.